I didn't grow up in a liturgical tradition. But through my experiences with The Book of Common Prayer I am slowly learning the ropes. But as a neophyte I still make a lot of mistakes. For example, I tend to mix up Advent songs with Christmas songs. I sing the Christmas songs during Advent. Which drives liturgical purists crazy. But by far the hardest thing for me to get used to, liturgically speaking, is the fact that it's still Christmas. Christmastide lasts from the Feast of the Nativity (December 25) to the Feast of the Epiphany (January 6). These are the proverbial "Twelve Days of Christmas." Growing up we just had "Christmas Day." Thus, Christmas was over on December 26th. And I'm finding this to be a hard habit to break. I keep thinking Christmas is over. So I have to remind myself, almost daily, "It's still Christmas. It's still Christmas." What makes this hard, as I remain in my non-liturgical tradition, is that everyone around me has moved on. Friends keep apologizing for still having their Christmas trees up. And I keep saying, "No worries. It's still Christmas! The tree should stay up until Epiphany." I think I'm being helpful in pointing this out. But mainly I just get strange looks. That said, I think the biggest culprit in this truncating of Christmas is New Year's Eve and New Year's Day. Smack in the middle of Christmastide is this other "holiday." Though it isn't, in fact, a holy day at all. Still, as the "next" celebration New Year's Eve causes us to truncate Christmas. The Christmas tree might stay up on December 26th, but it many Christian homes the tree doesn't make it past January 1st. This is sad and problematic for two reasons. The first reason is this. We all lament the commercialization of Christmas. But what few Christians realize is how we unwittingly enable this trend by restricting Christmas to a single day. If you restrict the celebration of Christmas to a single day you strengthen the association between Christmas and opening gifts. The point of Christmas becomes the shopping for and opening of presents. In fact, for many I'd say that Christmas is officially over once the presents have been opened. Christmas isn't really even a whole day. It's a few hours lasting from the time the kids get up until the presents are all opened. In many Christian households Christmas lasts about an hour, roughly from 6:00 am to 7:00 am. Christmas is over before lunch on December 25th. No wonder the opening of presents has come to dominate the celebration of the Incarnation. The celebration of Christmastide, the full Twelve Days of Christmas, can help push against all this. Christmas isn't an hour. It isn't a morning. It isn't a day. It's a twelve day season. So let's resist the cultural push to be productive and "get Christmas put up" as soon as possible. Leave the tree and the Nativity set out. Let's slow down and prayerfully linger. Yes, well into the New Year. Let the kids learn that Christmas cannot be reduced to the one hour when they opened their presents. Christmas isn't over. We're still in the middle of it. The meaning of the Sabbath is to celebrate time rather than space. Six days a week we live under the tyranny of things in space; on the Sabbath we try to become attuned to holiness in time. It is a day on which we are called upon to share in what is eternal in time, to turn from the results of creation to the mystery of creation; from the world of creation to the creation of the world. Again, I think Heschel's observations apply to the Christian liturgical calender. We learn to free ourselves from the slavery of the "To Do list" and the punchclock of modern economies to move within a "holy time," a cathedral in time set apart for worship and renewal. But we can't celebrate these cathedrals of time if we rush through celebrations like Christmas. Especially so if we are allowing secular time--the change of a calender year--to trump liturgical time. To allow New Year's Eve to truncate Christmas is a symptom of the very disease the liturgical calender is trying to cure. So let's keep the celebration going. "Six days a week we live under the tyranny of things in space; on the Sabbath we try to become attuned to holiness in time." Fascinating from the standpoint of having studied astronomy. Einstein's relativity has taught us so much about space, but is rooted in an understanding of time as an independent dimension of the universe. 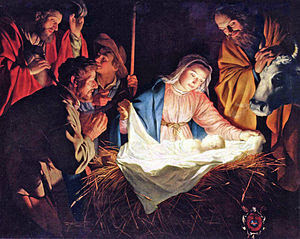 To be honest, Christmas actually lasts until February 2nd - Candlemas or The Presentation of Christ in the Temple. At the convent we left our Christmas tree up until then. Imagine, hoovering up all those pine needles up all that time! okay so our family has celebrated advent for a few years now, lighting the candles every evening, reading scriptures, praying - and I've been bummed that Christmas Day comes and we only get ONE DAY to sing all the happy songs!! thanks for the "well, duh" moment here that we get 12 days of Christmas. I'm new to this, too. but I love it. we've already un-decked the halls, but I'm excited to add something new to our traditions next year... 12 days... how much fun!! Beautiful. Thank you for these edifying words... They arrive "right on time" for me. Either you are a genius who is incredibly tuned in to the cosmic wavelength that I'm surfing today, or, God is a genius. Maybe a little bit of both. Grace and peace indeed. If you're enjoying Christmastide, may I recommend Lent (which commences on Ash Wednesday, Feb. 22 this year)? And then Holy Week and its climax, the Easter Vigil. The Book of Common Prayer as a useful guide to liturgical time, too (versions of this are free for the downloading online). Not suggesting everyone needs to be an Episcopalian (or any other denominationally-specific "ian," "ist" or "al"). But many who have lost track of liturgical time would benefit from reclaiming it, as pointed out in this post. It belongs to all of us. Thank you for this reminder. Working and living in a non-liturgical region, the fundamentalist, puritanical, social pull makes for easy surrender or an uphill battle. Sacred time and space is minimized in the puritan Protestant tradition. Astringent liturgical sensibility is a needed counter to the chief sacramental abuses: magical thinking and victimizing. But such sensibility can lead to all work and no play, no wonder, no enchantment, no miracle, no mystery. In our North American society, horror films, science fiction, fantasy, and mystery thrillers simply elide into superstition. My family was driving back from Christmas Day services to find that the local Christmas music station stopped playing Christmas music abruptly at noon. On Christmas Day! Oy. The "embarrassment" of celebrating Christmas after Christmas Day is so odd. Our culture is ready to move on. The appetite for consumerism is sated for a moment (because there are sales after Christmas Day to attend to! Especially since I didn't get every single thing I wanted! ), and the token celebrations of "family," "peace," and "love" are done and over with. Is it because Christmas is a guilty pleasure? For one month or so, we're permitted to indulge in talk of hope, love, concern for the poor and friendless, God, life's true meaning, but once those presents are opened we're expected to go back to the status quo where there is money to be made, toil and selfishness and apathy to believe in. Is it because we see Christmas as a childish thing, something that should be abandoned as quickly as possible? In the run-up to Christmas Day, we're eagerly anticipating the joys that will come Christmas Day. It comes, and it's over with. Silenced. In observing the Christmas season, instead we're permitting the bell rung on Christmas Day to continue to ring, slowly fading into Epiphanytide. On the other side of the liturgical calendar, we see Lent has 40 days, Easter season has 50. We make a big deal of the fast / penance / token "giving up something for Lent", but then we forget to celebrate for a whole season of 50 days! A wonderful post. I've [today] just had the discussion with my wife about taking down our holly wreath. As a Quaker, we technically don't 'do' Christmas (its not that we don't, its more that we try to do it every day). But, Hurray for it still being Christmas! Hurrah! Thanks for this. I think we miss so much (and miss the point) when we don't celebrate the Christmas season fully. It's always a treat to sing "We Three Kings" on the Sunday following Epiphany, as well as a good reminder that Christmas didn't end after the Dec. 25 unwrapping frenzy. The Christmas carols seem to divide evenly into hymns also appropriate for Advent and hymns just as relevant for Epiphany. This year on my blog, I'm celebrating "In the Bleak Midwinter" for each of the 12 days of Christmas--it's my little bit to keep the celebrations and feasts going. Thanks for your thoughtful reminder that it's still Christmastide (I love that word!). Back in England we always kept our Christmas decs up until twelfth night because it was considered "bad luck" to leave them up longer. Incidentally, some Christians celebrate Christmas Jan 6th so I guess liturgical is relative too. This Christmas I was alone, four thousand miles from family, and with friends here having (rightly) retreated to spend the days with their own families. So frankly the last thing I want to do is keep Christmas going. Everything's back in its box and I'm all about the bright and hopeful New Year. And it's a reminder there are many for whom Christmas looms every single year like an inevitable, unavoidable onslaught of Lack, and it's a hard hard thing to celebrate. It takes all the God-given will in the world and beyond to center on Jesus' birth and feel grateful. After all, it's not as if Jesus was born on Christmas Day, and the festival feels more secular to me or at least as secular as New Year, with its worship of family and sparkly lights. And if Christianity can 'repurpose' other 'pagan' holidays (for better or worse) then why not New Year? Sorry, bit of a scroogy rant. I have Christmas fatigue, evidently. Is it strange that my only New Year's resolution is about how I will celebrate next Christmas? I only just started to try to integrate the traditions of Advent into my standard American Christmas this year and it didn't work out too well. Next year, I'm going to be much more purposeful about observing Advent as a time of spiritual preparation and the entire twelve days of Christmastide as the celebration of Jesus' birth. If I come up with any creative ways of doing this, I'll let you know. And I was feeling so good...we got the tree back in its box with new improvised dust coverings and everything but the door wreath is packed away....alas, victims of both liturgical icococlasm and secular default! Keep on stimulating us with the fresh air of discovery and different thinking! Richard, have you tried saying, "No worries! It's still ChristmasTIDE!" You could stress the -tide as a compromise; it may not be Christmas (*cough*Day*cough*) anymore, but it's still the liturgical Christmas season (*cough*which is constitutive of Christmas*cough*). It's fascinating for me - very immersed in a liturgical tradition - to read about people's shock at discovering things I take somewhat for granted (though I still struggle to celebrate them fully!). I was shocked to see people on Twitter talking about taking down their tree on the 26th... I had to struggle to not reply that Christmas had only just started! January 1st is, however, a holy day - it is the feast of the Naming of Jesus (aka the Circumcision). A holiday, a feast, but very much part of the Christmas season, not the end or a break in it! Many blessings as you try out and incorporate these new traditions. We used to leave our decorations up until January 6th or 7th, but with a six year old in the house who enjoys putting all that stuff up the day after Thanksgiving, I am more than happy to take it all down on January 1st or 2nd. But you have given me something to think about as far as setting time aside to truly understand, enjoy, and celebrate Christmas on more than one day. We love Christmas in our house! We celebrate all twelve days wholly and fully. We call all of our children's God-parents on the Feast of the Holy Name, we remember and celebrate St. John, St. Thomas Becket, St. Steven and St. Wenceslas. We sing our hearts out! We have a big party on Twelfth Night, making food from three of the traditionally-ascribed homes of the Magi; India, North Africa and Arabia. We eat King cakes, we drink Lamb's Wool, we crown a King and Queen of the party. We have a massive bonfire and friends all bring their greenery to burn (ours stays up until the end of Epiphany). And we don't give one another presents until Epiphany (yes, Father Christmas fills our stockings on Christmas morning with a few special little gifts, too). We leave our Creche and the Magi out until Candlemas at our house, and we love living with baby Jesus for that whole season. One of my favourite websites for enriching our home-based observances is FullHomelyDivinity.org I'm not in any associated with that website, but thought you may enjoy it. Thanks for your thoughtful post, and I do hope you are having a very merry Christmas indeed! So I am from Massachusetts. Lutheran pastor. We never sing Christmas carols in advent. I had some Congregational person who joined our church and was indignant about this. Blew me away. I never knew people sang – in worship – Christmas carols before the 24th. Well, we have two pageants for the kids, we break down then. The Christmas season – what 2 weeks – we sing carols throughout our liturgy – I just swap out the usual stuff and swap in a carol. Works for me. And the wife (also a Pastor) we keep the tree up all through the Christmas season, heck, all through Epiphany… heck – up to Ash Wednesday if we can. I would love to say this is because of our liturgical identity, makes me sound like a liturgical purist – kind of like the Word of God conservatives… liturgical people can be the same way – what is PURE/TRUTH? Really, it is because we are lazy and because we like to get our monies worth out of the thing and because it is dark up here and we like the extra lights in the evening. This is contextual theology. You adapt the Word to its context. Light in the darkness, all that. I was pleased to see that she hung up the wreath over the door yesterday – been sitting in the garage for two weeks. Well… maybe I should have done that. But let us relax – wanna sing carols in early December? God bless you. Growing up in the tradition of not celebrating Christ's birth, I felt an emptiness at Christmas. Then one year we stayed in the apartment of a woman while she was out of town visiting family. Her only Christmas decorations were her many nativity scenes set up around the apartment. As I walked around, noticing each one, I felt a sense of peace and realized what my Christmas had been missing. I still have some of the trappings of a secular Christmas, but at the center are my nativity scenes which are a reminder to me of what matters - not one morning, but the season of anticipation and realization of the miracle of Christ's birth. I removed all of my decorations around the new year, but left my nativity scenes until today, January 6th, and will leave them up awhile longer. When my daughter was little, I read her the story of Christ's birth throughout the year and sang "Away in the Manger" every night. It isn't a story for only one day or one season. It should be in our hearts year round.